Unemployment in Scotland rose by 19,000, to 231,000 in the period September to November 2011, according to Office for National Statistics (ONS) data released today. The Scottish unemployment rate is 8.6 per cent, above the UK average of 8.4 per cent. The labour market statistics also show employment in Scotland has decreased by 8,000 over the three months to September - November 2011. The number of those in employment in Scotland now stands at 2,467,000. In December 2011, the number of people out of work and claiming Jobseeker’s Allowance (JSA) was 140,900. This is a fall of 1,400 over the month and the fourth consecutive monthly fall. ”There can be no clearer signal we need to focus on getting the economy back to health than the rise in unemployment shown by these figures. We have to get Scotland back to work and it is imperative we keep making the right decisions to support and grow our economy. Restoring confidence and stability will require work across every sector and I will continue to meet with a wide variety of businesses and organisations in the coming weeks and months. “Tackling youth unemployment continues to be a major focus and I will chair a major national event on the issue in March to build on the seminars held throughout Scotland over the last year. We are taking major practical steps through the UK Government’s Youth Contract, a £1 billion initiative backed by business and aimed directly at helping the young unemployed into work. “There is no doubt it will take the committed efforts of both of Scotland’s governments to overcome the scourge of joblessness among our young people and I will work with the Scottish Government, agencies, civic Scotland and anyone else to get people back into jobs. - Employment in Scotland fell by 8,000 over the quarter, and fell by 5000 over the year to stand at 2,467,000. 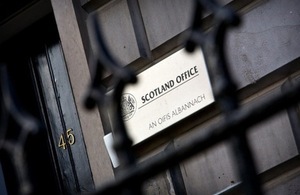 - The Scots employment rate fell over the quarter to 70.9 per cent. The rate is above the UK average of 70.3 per cent. - Unemployment in Scotland increased by 19,000 over the quarter and rose by 7,000 over the year. The level now stands at 231,000. At 8.6 per cent, the Scots unemployment rate is now above the UK rate as a whole which stands at 8.4%. - Economic Activity increased by 11,000 over the quarter and now stands at 2,698,000. The Economic Activity rate increased by 0.3 per cent over the quarter, and stands at 77.7 per cent. - In December 2011, the number of people out of work and claiming Jobseeker’s Allowance (JSA) was 140,900.